This is the dessert trifecta jackpot. Three favorites in one. Soft pumpkin bars, cinnamon-sugary snickerdoodles, and buttery blondies rolled into one easy recipe. Lately I’ve been going nuts with pumpkin recipes, snickerdoodle recipes, and I’ve got 25+ blondies recipes and counting. It was high time to marry my favorites. 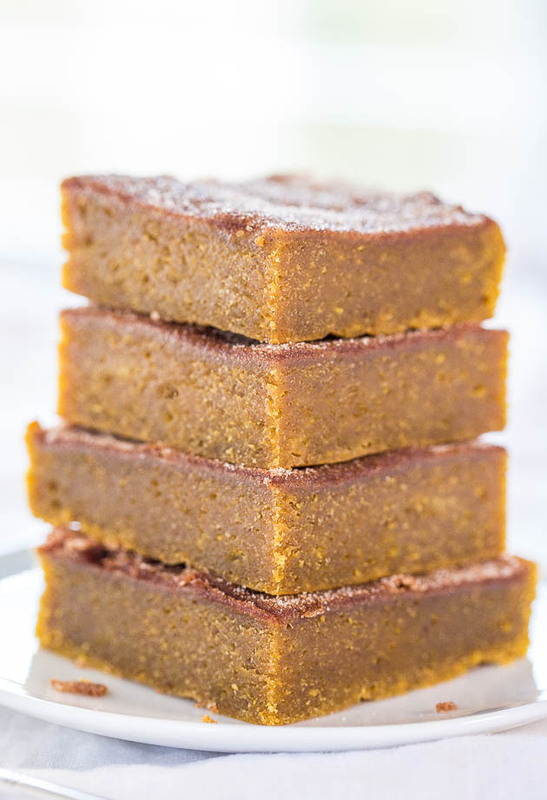 The bars are super soft, moist, and full of robust pumpkin flavor. The cinnamon-sugar topping lends an awesome texture contrast to the density the pumpkin creates. And make no mistake, they’re dense like blondies should be, rather than cakey or light. They’re for those of us who relish a thick, fudgy texture. I could see where some people would want to add baking powder or soda for some lift, but I prefer them without. 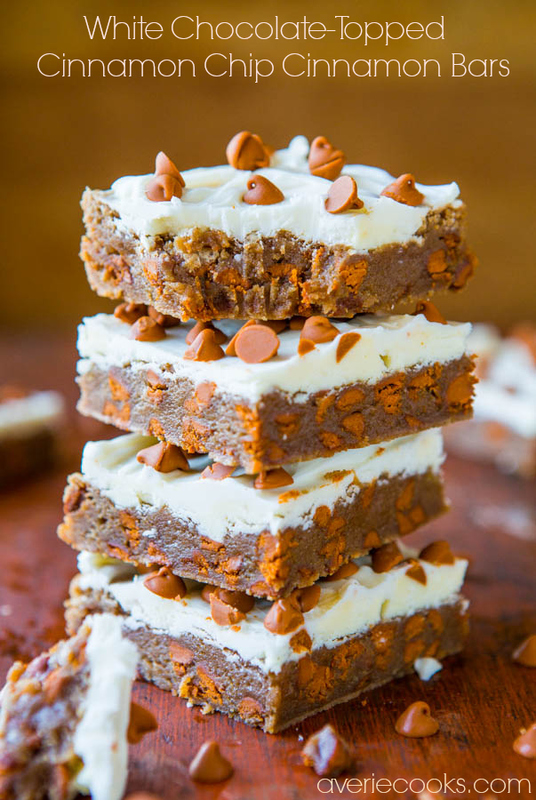 I modeled them after my Soft Pumpkin Chocolate Chip Bars. It’s an easy, no-mixer, one-bowl recipe that takes just minutes to whisk together. Melted butter, brown sugar, pumpkin puree, plenty of pumpkin pie spice, and cinnamon-sugar are the key ingredients. 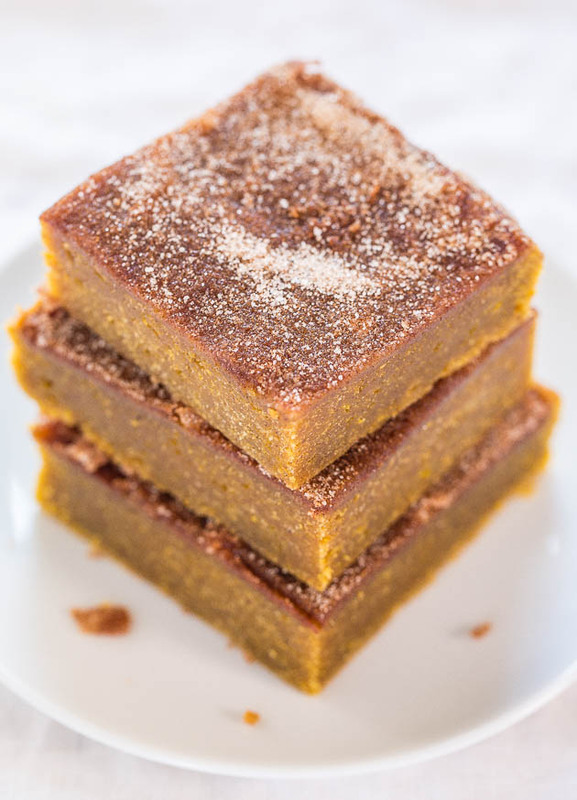 The recipe only makes an 8-inch pan and if you have pumpkin fiends in your house, the bars will probably be gone in a day. However, if you can resist, they taste better on the second day after the flavors have married. As a bonus, the bars get softer and moister on the second and third day, but I doubt they’ll last that long. They’re such a perfect bar for me. Simple to make, packed with flavor, and the tooth-sinkingly dense texture is amazingly satisfying. If you haven’t already ordered it, Cooking With Pumpkin: Recipes That Go Beyond the Pie is my second cookbook and the official release date was on Monday, October 6. There’s over 50 pumpkin recipes including sweets, savory, drinks, and a photo for nearly every recipe. I’d be super grateful if you headed over to Amazon. Soft pumpkin bars, cinnamon-sugary snickerdoodles, and buttery blondies rolled into one easy, no-mixer recipe. 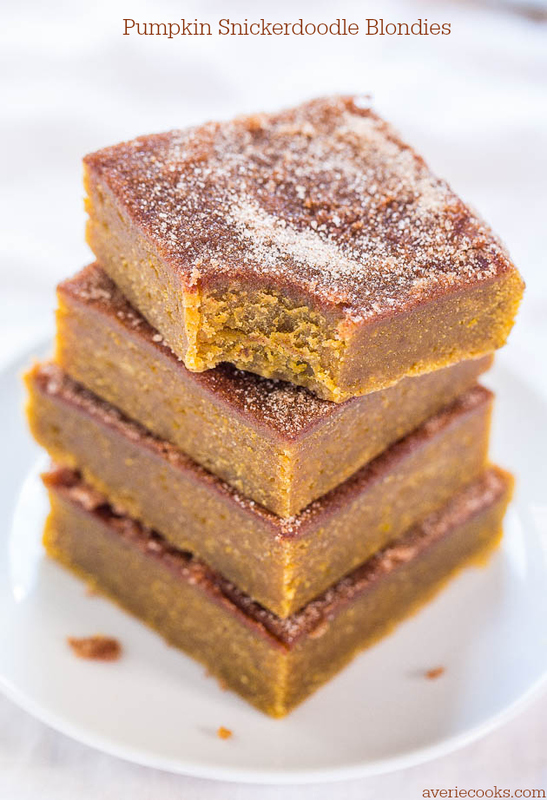 The bars are super soft, moist, and full of robust pumpkin flavor. The cinnamon-sugar topping lends an awesome texture contrast to the density the pumpkin creates. They’re dense like blondies, rather than cakey or light. They’re for those of us who relish a thick, fudgy texture. If you can resist, they taste better on the second day after the flavors have married. As a bonus, the bars get softer and moister on the second and third day, but I doubt they’ll last that long. Wait momentarily before adding the egg so you don’t scramble it. Add the egg, brown sugar, pumpkin, vanilla, pumpkin pie spice, and whisk until smooth. In a small bowl, combine the granulated sugar, cinnamon, and stir. Bake for about 25 to 27 minutes, or until done. A toothpick inserted in the center should come out clean, or with a few moist crumbs, but no batter. The moisture content in pumpkin varies, as do climates and ovens; bake until yours are done. Allow bars to cool in pan for at least 30 minutes before slicing and serving. I find the bars taste better on the second and third day after the flavors have married. Bars continue to get softer and moister for about 3 days after baking, noting the cinnamon-sugar coating will melt (liquify) as time passes rather than stay granular due to the moisture from the bars. Bars will keep airtight at room temperature for up to 1 week, or in the freezer for up to 6 months. Soft Pumpkin Chocolate Chip Bars – Super soft and are like biting into a piece of rich pumpkin fudge! Loaded with chocolate and crazy good!! 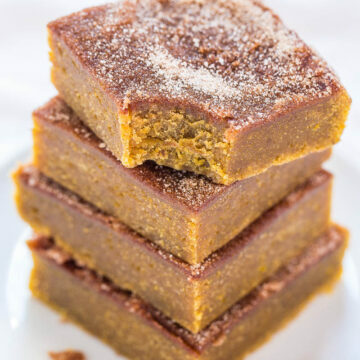 Fudgy Pumpkin Bars with Vanilla Bean Browned Butter Glaze – Bars so soft they’re like biting into pumpkin fudge! The glaze is amazing! White Chocolate-Topped Cinnamon Chip Cinnamon Bars – Bursting with bold cinnamon flavor and creamy white chocolate! Cream Cheese-Filled Pumpkin Bread– Pumpkin bread that’s like having cheesecake baked in! Soft, fluffy, easy and tastes ahhhh-mazing! This recipe is SO YUMMY! There’s pumpkin and spice flavor, and the texture is like a moist fudge yet much lighter. I can’t wait to see if the flavor develops even more tomorrow! I’m so glad you like them and the flavors continue to deepen and marry as time passes so I think you’re in for a treat! We have SO much cream of tartar in our apartment and are looking for some creative snickerdoodle recipes to use it in, do you think if I add a teaspoon or so of it to this it will turn out ok? Or is there a specific reason you opted not to use it? It’s one of those ingredients MOST people don’t have on hand, but if you don’t, I don’t think it would hurt…and may make them a little puffier/more airy and add a bit of flavor. LMK how it goes! I love anything with pumpkin, both sweet and savory. Tried these last night and they’re OMG yummy. Next time the chocolate chips go in! Glad you liked these and for a chocolate chip + pumpkin recipe, follow the Pumpkin Chocolate Chip Bars recipe linked in the Related Recipes! Those are soooo good! The results of this recipe are fairly good. I must say, however, that I won’t return to this blog for recipes again… the sheer volume of ads, especially pop-up ads, is overwhelming and obnoxious and frankly, pretty tacky. I turned on an adblocker, and right now it’s telling me it’s blocking TWENTY ads from your site right now. Wow. I get that you’re trying to make money, but when people literally can’t read your recipe because the pop up ads just won’t stop coming and keep blocking the screen, you’re not going to make much. You need a better business plan. I’m sorry that you experienced pop-ups. My site is NOT supposed to have pop-ups and I’ve forwarded your message to my ad network partners to make them aware. Sometimes popups are accidentally included in the rotation and that’s not my intent. 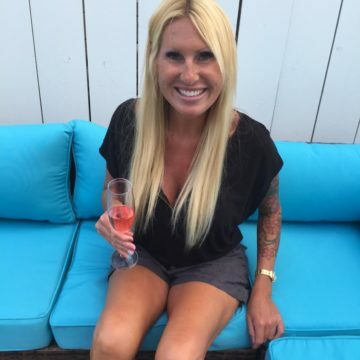 Hi Averie! To begin, I have to say THESE ARE AWESOME. I am not a huge pumpkin fan, but I have a good friend who asked me to find a pumpkin bar that would ship well. I thought these looked like they might fit the bill, so I made them. At first glance and taste, I was kind of “meh.” But, since you said they taste better the second day, I waited. It was DEFINITELY better the second day, but even BETTER on the third! I love the fudgey texture and the crunch of the cinnamon sugar on top. Thank you so much for the excellent recipe and new weapon in my arsenal of goodies. So glad these worked out for you and yes, they DO get better on the 2nd/3rd day, you’re totally right and yes to being able to withstand shipping because of the texture. If you try any other recipes, LMK! Is there any conversion for a 9×9 baking pan. I don’t own a 8×8, and am dying to make these. I know I’d have to decrease the cooking time, but do I need to change the oven temperature as well? You can bake in a 9×9 but bars will be thinner (very thin, actually), therefore cooking time will be reduced. You don’t need to reduce oven temp. Just made these blondies this evening, they’re delicious. First time I’ve made blondies (never made brownies from scratch either!) and first time I’ve had anything with Snickerdoodle flavours, so it’s a definite first for me. Can’t wait to try them tomorow when they’ve had overnight to let the flavours develop. Thanks for sharing this wonderful recipe! So many firsts and not that you know how easy it is and how the results taste, keep on baking! :) Glad you loved these! In the oven now! 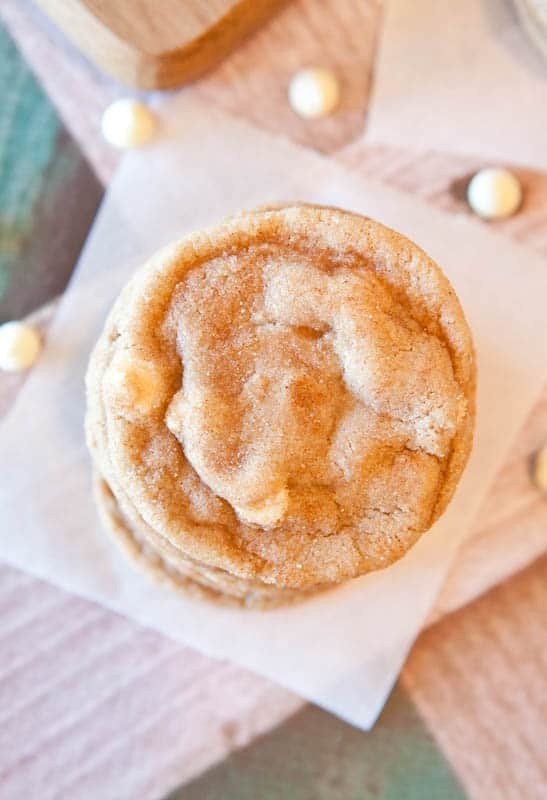 Just took the Mrs. Fields copycat Snickerdoodles out. Fun afternoon baking! Have you ever made any of your pumpkin recipes with coconut oil? I’m contemplating swapping it for the oil/butter in either this recipe or your pumpkin oatmeal muffins, but I’m not sure if the coconut flavor would taste off with the pumpkin. I’m open to try it, but thought I’d check with the expert first! :) Either way – these are going in the oven tonight! Yum!!! You can totally use coconut oil in place of veg/canola oil. Don’t swap oil for butter (because that’s a whole other animal) but yes, swapping for regular oil is fine and I actually love the pairing of the coc oil w/ pumpkin. If you already like coc oil, you’ll love how it pairs with pumpkin. Sigh. I really wanted these to be good. But, they weren’t. The color was not “blondie,” the texture was not “blondie,” and the taste was not snickerdoodle. I’m sorry you didn’t care for the recipe. The color you see in the pictures is the color they are when I make them. The pumpkin turns them a darker shade and also the texture is denser, which I mentioned in the post. Thanks for trying the recipe. Averie: well what do you know! Several day s later, square bars heated up in the microwave, with a dollop of whipped cream…were so good. The topping finally melted in (even before the microwave) and was so tasty. I will now make this again, but several days ahead of time for maximum deliciousness. So glad that the flavors developed over time and you’re happy now! 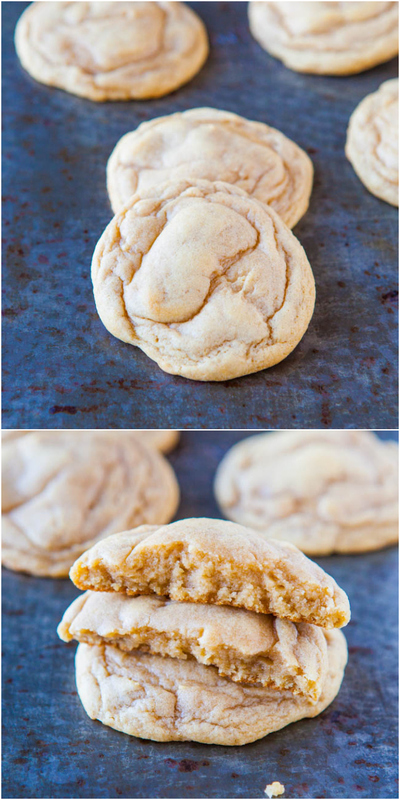 Pumpkin desserts are often like that (kind of like chili), it gets better over time! these were fantastic! 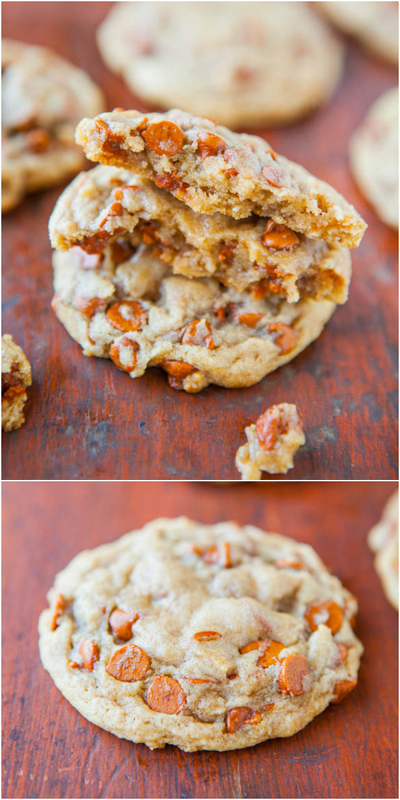 my only regret is not having chocolate chips in the house, because the chocolate chip version of this recipe looks soooo good. I plan on making these today for thanksgiving. I don’t have a 8×8 pan. Could I double it and bake it in a 9×13 pan? How long would I cook it for in that size of a pan? I haven’t tried doubling the recipe but generally 8×8 recipes double fairly well for 9×13. Baking time will likely be similar. These are amazing!!! 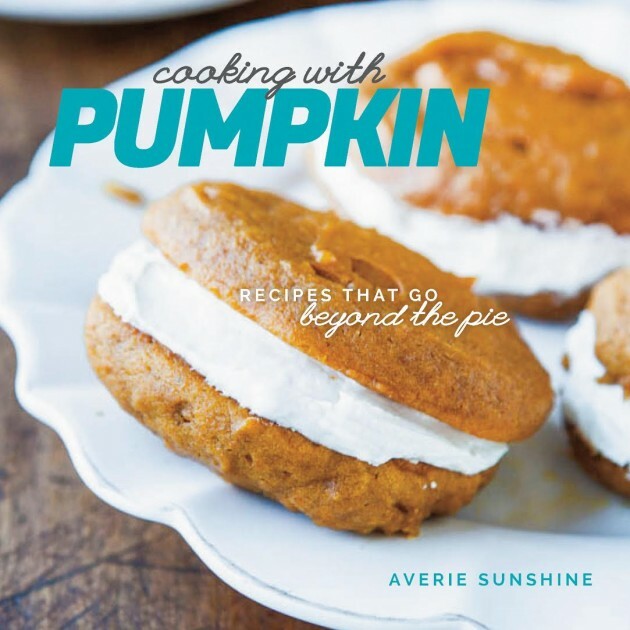 I can’t wait to get your pumpkin cookbook. Thanks for trying the recipe and I’m glad it came out great for you! And I hope you get my cookbook, thank you! These look amazing!Any chance they freeze well on top of looking delicious? They freeze really well! You would likely want to reapply some cinnamon-sugar to the top though. I made these last night to take for a funeral reception, and I was very disappointed. They turned out very rubbery and the taste was mostly cinnamon. I followed the recipe to the letter and they looked just like the picture, so I don’t know what happened. I threw them away and will stop at the store to purchase something else. I have been cooking for over 50 years, so I usually know when a recipe is not going to work, but not this time. Thanks for trying the recipe and I’m sorry they tasted rubbery to you. They are a very dense bar, given the pumpkin in them, but sounds like something beyond that took place. Maybe too much flour? Hard to guess from afar but thanks for giving the recipe a try.